"THE LALLY RALLY" - TRA-Quincy YouthBuild Success Story | Training Resources of America, Inc. In January 2012, he dropped out of high school and then got himself in trouble with the law. “For the next 6 months, I sat in a jail cell wondering what I was going to do next,” Paul said. A friend told him about YouthBuild and in October 2012 he took control of his future. Paul is a born leader. After his initial interview with Quincy YouthBuild, he was so inspired and enthused that he convinced his friends Pat Gaskell and Joey Ingemi (two other YouthBuild success stories!) to join as well. 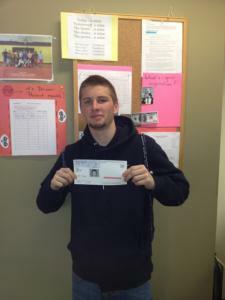 In February, 2013, Paul was the first in his YouthBuild class to obtain his GED. Always a voice for fairness and equality, Paul was elected by his peers to represent them on the Quincy YouthBuild Policy Committee. Paul championed for the month of March to be designated Driver’s Permit Month. After a few weeks of road rules instruction, both classroom and independent study, Paul blazed another trail straight into the Registry of Motor Vehicles (RMV) and was the first to receive his Massachusetts Driver’s Permit. “We’ve dubbed it ‘The Lally Rally’... he just keeps stepping up and making good decisions,” says Quincy YouthBuild Case Manager, Donniece Watson. With graduation scheduled to take place in early September, Paul has been actively job searching and interviewing. He continues to tutor and coach his peers in their GED endeavor and he is prepping to attend Quincy Community College this fall.